A few Sundays back we made another trip to the Burgess-Shadbush Nature Center for some caching. While waiting for others in the group to arrive, Chris (of TeamLegend4) and I spent some time working the new cabin onsite. 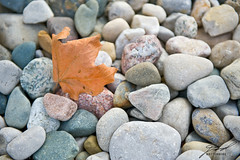 Near that cabin we found this sole autumn leave stick in the stone. Our fellow Geocachers had shown up about this time though so we only snapped a couple of quick frames before heading back to the parking lot in preparation for the afternoon hike.